Do you ever get so overwhelmed by how far behind you are and how much work you have to do that you just don’t do it? And then you get even further behind and it stresses you out more so you just continue to avoid it and this horrible cycle continues. That has been my life for several months now. I don’t mean I’ve been sitting around doing nothing all the time. Quite the opposite actually. I’ve been working a lot since Christmas and when I’m not at work I’m at home desperately trying to get things done. I’ve been writing blog posts and book/film reviews; I’ve been working on fanfiction chapters; and I’ve been making progress on my book. But I think all of you can relate when I say there just aren’t enough hours in the day! Seriously, sometimes it feels like I never stop and yet it never feels like I actually got anything done. I used to get a couple posts done or a couple chapters written and I’d start to get back into my routine of posting regularly, but then I’d fall out of it again and it was like starting back at square one. So, since I’ve been MIA for quite a while now I figured I’d post a quick update just so anyone who reads this blog doesn’t think I’ve fallen off the face of the Earth. I am very excited for things coming up later this year. I’m attending Fan Expo and the Supernatural Convention again and I will be blogging about those. I’m desperately waiting for Fan Expo to post it’s schedule so I can start making arrangements and figuring out if I’m going to be getting any photos or autographs this year (let’s face it, I probably will). I will definitely be returning to the blogosphere and the fanfiction world. I can’t say exactly when just because I don’t want to make any promises or guarantees and then not stick to them. Other than that my life right now consists of working, reading, and, as of today, playing Pokemon GO. I’m sure downloading this game will be absolutely no help in my trying to get back to writing on a regular basis. However, I think it will help with the lack of exercise I get (or rather, don’t get). So, thank you to any followers of this blog for your patience. I look forward to rejoining you regularly very soon! When I was younger I would read all the time. Literally, just one book after another. I carried one with me everywhere (still do) and even when I wasn’t supposed to be reading, like, during class for example, I did anyway. Now, being older, I don’t have nearly as much time to read as I would like, but I still try to read as often as I can. That being said, way back in the summer of 2007 (it’s actually quite a while ago if you think about it), I started keeping a record of how many books I’d read and how many pages they were. It started being divided by the summer and school years, but then I just started doing it by year. So, now that I’ve babbled on and explained (poorly) how this system worked, here is a list of the things I read in 2015! I was a fan of The Walking Dead show before reading the comics, but after hearing repeatedly how different the comics are from the show I decided I had to read them. I’m not going to get too much into what I thought of the books as I reviewed books 1-4 last year. I will say that so far I’m thoroughly enjoying the storyline both on the show and in the comics. I plan on reading at least books 5-8 this year (hopefully more, depending on if I can get them from the library). The only book I read this year that I haven’t reviewed yet. Not because it wasn’t good, but because I wanted to read Black Edition II first. I’d already watched the anime of Death Note before reading the manga novels and I absolutely loved it. I knew immediately that this was something I wanted to read and when I discovered the Black Editions I was even more excited. The Black Editions are basically two of the novels in one. Instead of spending twice as much and buying the books separate, you spend a couple extra dollars and get two of the books. Death Note is amazing and I’ll definitely be posting a review of it this year as I recently bought Black Editions II and III. This book is brilliant. I had wanted to read it for ages and was so glad when I finally did. Emma Koenig perfectly captures the feelings that come with being in your twenties, whatever stage you may be at. I read and reviewed this book back in February and it is crazy how much changes in a year! Last year I wasn’t in school, had no job, and wasn’t doing too much. Now I feel like I hardly have time to slow down! It’s absolutely insane how quickly things can change and I definitely need to read this book again to see just how different things are. I still haven’t finished this series! I started it like a year and a half ago and I still haven’t finished. I’m not going to say I’ll finish it this year cause I think we all know if I say that then it won’t happen. However, I will say that I’m excited to read it again and actually finish it this time because all of these books, not just The Reptile Room, but all of them are amazing and enjoyable. This book still gets me even when I just think about it. I read this book in a matter of days and to this day I would say it’s probably in my top ten favourite novels. I loved this book, but to this day the ending gets me sooooo angry. If you’ve read it you’ll know what I’m talking about. If not, read this book. Read it because it’s beautiful and wonderful and Jodi Picoult is truly a literally marvel. And then I want you to come back here and tell me what you thought of the ending and if you were raging for days while simultaneously existing in a state of shock like I was. This book is one I need to read again simply because I still don’t think I fully got it. But, like I said in my review (which wasn’t really a review), I think not fully understanding the book actually just makes me like it more. This is definitely one of those books where even if you don’t fully understand it you’ll enjoy it. This is also one of those books where if you’re a book nerd you should read it. It’s not like the great novels of our time now. There’s no magic or great battle against an evil, superpowered villain. But there is a story and at the end of the day Slaughterhouse Five is exactly what all great novels start out as and what they all end up being. I love reading. When people ask me what I like doing the first two things I always say are reading and writing. It’s been like this for as long as I can remember and, even though I don’t have as much time as used to, I don’t doubt it will stay like that. I look forward to reading many more books over the course of this year. Hopefully I’ll be able to finish all the books I started at the end of last year and more. My reading goal every year is to do slightly better than the year before. But I want to hear from you! What did you read last year? Have any reading goals for this year? 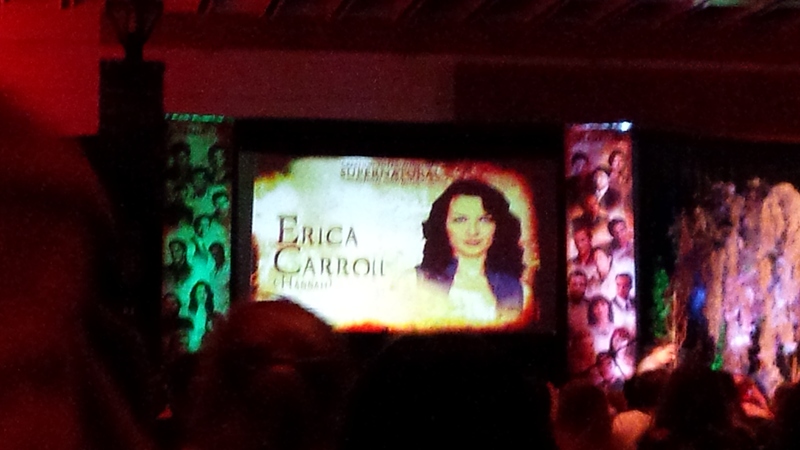 Torcon is finally here! Oh my goodness I feel like I have been waiting for this weekend forever and now it’s here! This is the first time I’ve been to Torcon for a full weekend. I’ve gone for the past two years, but only ever went on the Saturday because it’s always been too expensive. This year it was still expensive, but the show’s been on for ten years and I decided to splash out a little bit and go for the whole weekend. I’ve been really good about not splashing out anymore on any merchandise and I’m hoping to keep it that way. The way things are looking tomorrow I may not be entirely successful, but we shall see. Alright, so I was a little late getting to the convention today so Richard Speight Jr. (who is MC-ing the whole event) was already on stage. However, I was there in plenty of time to see all the panelists. 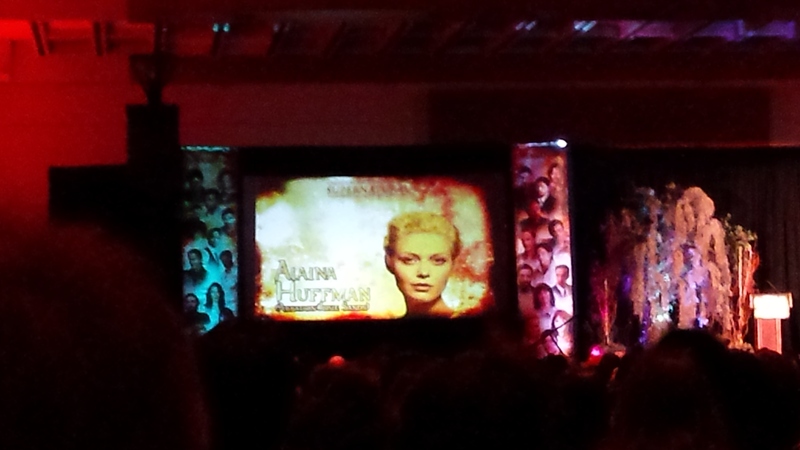 The first one up was Alaina Huffman (Abbadon)! Alaina was a little minute addition to the guest list after Ruth Connell unfortunately had to cancel. However, I’m so glad Alaina was here! She’s amazing and hilarious and she’s Canadian! It was really funny because every time someone would answer a question she would give them candy. Richard Speight Jr. made the joke I think many of us were thinking which is that taking candy from strangers doesn’t matter when you’re at a Supernatural convention. Something I really liked about Alaina’s panel was that she talked about women’s roles (or lack thereof) on TV and how women need to be given more roles. Yes! I am so glad she mentioned this especially at such a huge event for a huge show. It’s absolutely amazing and completely true. 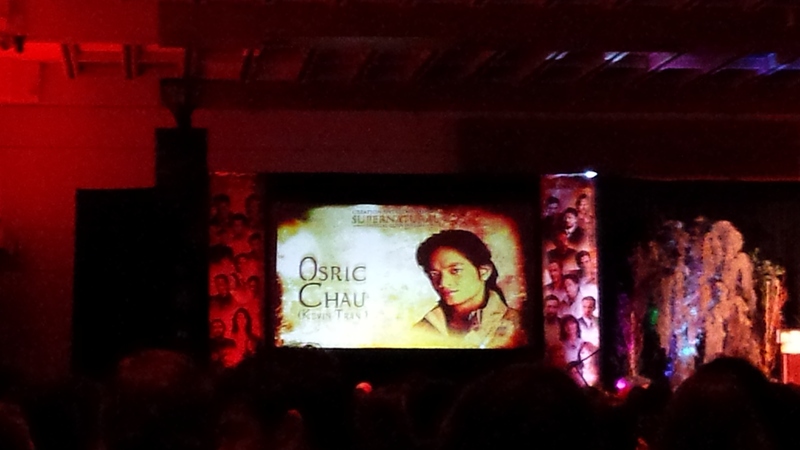 Next up was Osric Chau (Kevin Tran) who spent a lot of time talking about Cosplay. For anyone who doesn’t know, Osric cosplays a lot and you can find tons of amazing photos of him in so many phenomenal costumes online! Seriously, Google it. He was completely hilarious and talked a bit about how he’d like to see Kevin come back. Maybe Kevin could come back as a ghost, after all, ghosts can’t die again, right? Has he even seen the show?! Of courses ghosts die again, and it’s normally Sam and Dean who kill them! His reaction when he learned this was hilarious and it really was a great panel. These panels were followed by the Supernatural Yes/No Trivia Game which was hilarious because by the time they got down to the final two people, it lasted forever! Both contestants gave the same answer as the other over and over again and often times they were both wrong! It was so funny. 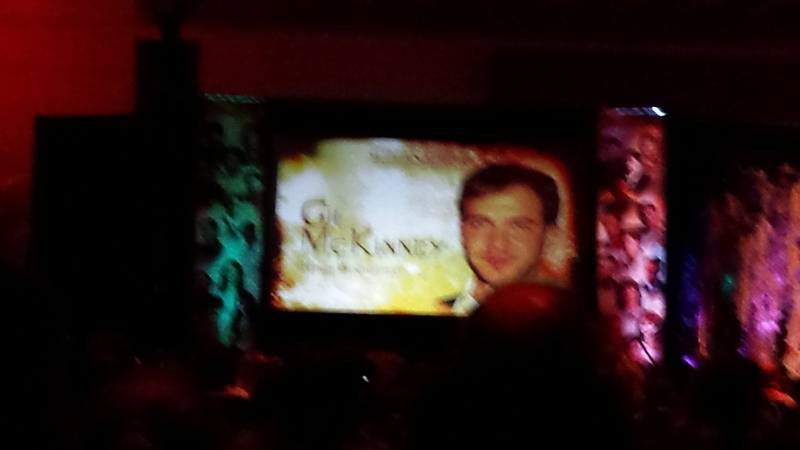 One the Yes/No Quiz was over it was back to the panels and up next was Gil McKinney (Henry Winchester)! Alright, so I’m a huge fan of Supernatural (obviously), but I’m also a huge fan of Once Upon A Time and I didn’t know that Gil McKinney plays Prince Eric on OUAT. I had no idea! Looking back now I’m smacking myself in the forehead for not realizing it. It definitely makes rewatching OUAT all the more exciting now. 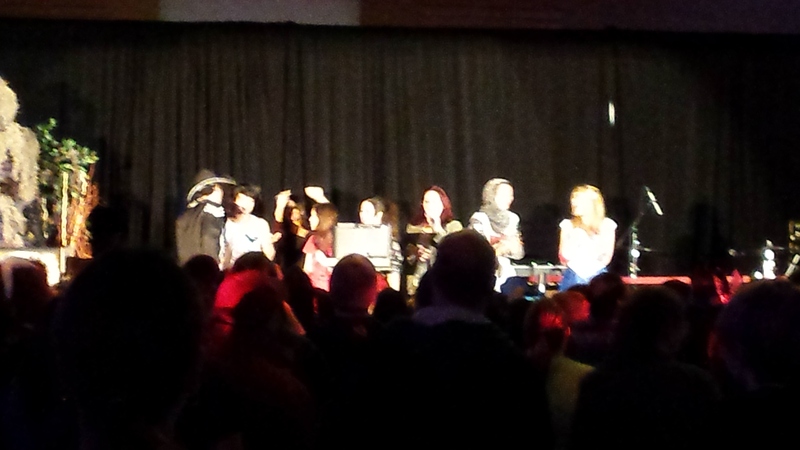 Something else I learned at this panel is that Gil McKinney is an amazing singer! Seriously fantastic. Go look him up on Youtube I guarantee there are tons of videos of him singing and you will not be disappointed. I took a couple videos at karaoke, but I’m betting you can find some better quality ones on Youtube than what I got on my phone. Gil McKinney is also the reason I may end up spending money this weekend as I’m considering buying a photo op with him. If I don’t do it this year then I’ll probably have to come back and do it next year cause he’s amazing and getting a photo would be awesome. The final panelist was Erica Carroll (Hannah) who also talked about women’s roles on TV. One thing she brought up about this in regards to Supernatural was the relationship between Hannah and Cas which she didn’t like too much. She said it was very easy to go that route and you know what, she’s right. You have a popular male character on the show and bring in a badass female character to work with him, it’s really easy to put them together and suddenly she just turns into a love interest. I’m really glad that’s not what happened with Hannah and I’m definitely hoping we’ll see more of Erica Carroll in the new season! Something else I learned during her panel is that in the episode with her naked scene? Not actually her. Yup, she said she made a choice and she stood by her choice and I think that’s amazing. They needed a naked back for that scene and she didn’t want it to be hers and I give her major kudos for that. Lena Headey did something similar in the most recent season finale of Game of Thrones. We see all of Cersei Lannister completely naked, but we’re not seeing Lena Headey who opted not to get naked. Huge kudos to all the women who choose not to get naked on screen and you know what? Huge kudos to the women who do get naked on screen. Kudos to the women on screen. Erica and Alaina are right, there isn’t enough of you so I give you props for getting out there and being badass no matter what you do. The final event of the night was the karaoke party (not spelt kareoke which is what I did all night) and this was great. I wasn’t sure if I was going to go originally cause I’d already gone back to my hotel, but I’m so glad I did cause it was so much fun. There were so many people there and so many of the actors got up and sang. Richard, Rob, and Matt were dressed as the Three Amigos while Kathryn Newton (Claire Novak) came dressed as Sailor Moon and she was completely rocking the look. From “Bad Blood” to “Lighters” to a lot of Bon Jovi, it was one of the best nights of my life. There’s still two more days of Torcon left and plenty more to see and do. Hopefully I won’t spent too much money, but I’m definitely looking forward to seeing everybody on Saturday and then Jared and Jensen on Sunday! This is the first time I’ll be seeing them at a convention so I’m super excited! Were you a Friday Person at Torcon? If you were I’d love to hear what you think! If not I’d love to hear what you think anyway! Let me down below your thoughts on Supernatural, conventions, if you’ve been to a con in the past, or maybe just about the meaning of life. Whatever you want! I’ll be posting soon about Day 2! Also, I’m hoping that if I attend again next year I’ll have a proper camera and can take some better photos than the ones I got on my phone as my phone isn’t crazy about the bright lights they point at the stage. A lot of the pictures turned out either out of focus or, if they were in focus, the people were glowing. I got some good Saturday shots because some of the people like Mark Sheppard and Misha Collins wander through the audience which means they turn the lights back on. Yay! This means pictures turn out looking like people! Woohoo! The Walking Dead returns tomorrow and I decided to celebrate with some Walking Dead names! I’ve also been celebrating quite a bit over on my other blog with a Top 10 Favourite Episodes countdown which you can find here!